What’s the weather like in Ireland on St Patrick’s Day? As the saying goes, if you don’t like the weather, then wait five minutes. The expression is never more true than in Ireland and even more so in the season changing months of March and October. Chances are so high that you might even have a little sample of all four seasons inside an hour. I’ve just spent a lovely weekend walking various routes to Glenveagh Castle in the awe inspiring National Park in Co. Donegal, in Ireland’s remote north west. 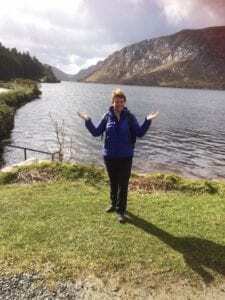 If you are planning a walking holiday in Ireland, you will need to include Glenveagh, not least for the stunning walks but also for the fabulous tea shop in the Castle. We can arrange a bespoke walking holiday for you in Donegal complete with tea shops and spectacular views. Mother Nature does not always co-operate but as long as you have the right gear, none of that will ever matter. The images below were taken twenty four hours apart over St Patrick’s weekend in Glenveagh National Park. 4 Tips for preparing for your cliff path hike. The cliff walk on the Antrim coast, guided by Paul, was even better than expected. Blind luck presented our group with a magnificent August afternoon to enjoy the incredible views. Paul’s easy commentary on the history of the coast was full of interesting stories and facts about the scenes we were exploring. The terrain was not particularly challenging for walking shoes with plenty of stops for photos. Arrangements to and from the walk were fairly seem less as Paul made sure time schedules and pickups were insured. The walk concluded at the Giant’s Causeway where we paused and reflected on the experience. Definitely a highlight of my trip to Northern Ireland! Seeing the Giant’s Causeway has long been on my bucket list and I wasn’t disappointed. As a single traveller I was looking for a way to get there that was reasonably priced and easily organised and the combination of coach trip and an afternoon walk seemed ideal. Walking to the Causeway rather than arriving by car or coach enhanced the experience for me and the scenary along the clifftop coastal path was simply breathtaking. The pace and terrain of the walk was perect for someone like me who could be a little fitter! Eimear was a knowledgeable and attentive guide and it was a pleasure to spend time in her company. I would highly recommend a trip to this beautiful part of the world! My husband and I thoroughly enjoyed our 5 mile guided hike along the headlands of Giant’s Causeway. We enjoyed getting away from the crowds and into the quiet of this beautiful landscape. Paul was our guide for the hike, and we appreciated his sharing his knowledge of both the history and the geology of the land. The pictures simply don’t do this justice. A tip: be sure to heed their suggestions on attire. It was very rainy and windy on our walk (which didn’t reduce our enjoyment of the trip). Being well dressed with clothing that kept us warm and dry was very important. I was working in Dublin for 5 months, and struggling to get out travelling. Paris was my big weekend trip before this tour, and I really should have just gone on this trip twice! Bare in mind the conditions were spectacular on the day I went, but it was beyond beautiful, with sheep posing for photos on the edge of unbelievablly beautiful cliffs. Combined with the views and commentary on the bus tour I joined to get there, I would say this one trip was the quintessence of Ireland! I’ll cherish this trip for the rest of my life, I doubt a single person on the bus tours will truly ever understand what they missed out on. 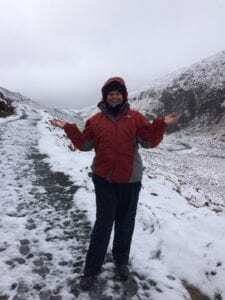 For background, I live close to and have hiked/climbed the absolutely beautiful Canadian Rockies, during my time in Ireland I hiked the cliffs of Howth, the hills between Bray and Greystones, went to Glendalough, Galway, Sligo and Newgrange. This trip with Away a Wee Walk was by far the most memorable and amazing time and place I experienced in Ireland! For hikers it’s a light walk, and for non-hikers expect to walk through mud, have changing weather conditions with no shelter…and in both cases expect to love it! This hike was more than we imagined. Eimear was a very informative tour guide and great company. My husband and I booked this on our visit to giants causeway. We would do this again and bring everyone we know with us.